A piece of paisley fabric. The definition of paisley refers to a pattern of colorful curved comma-shaped designs that is based on a design from India. 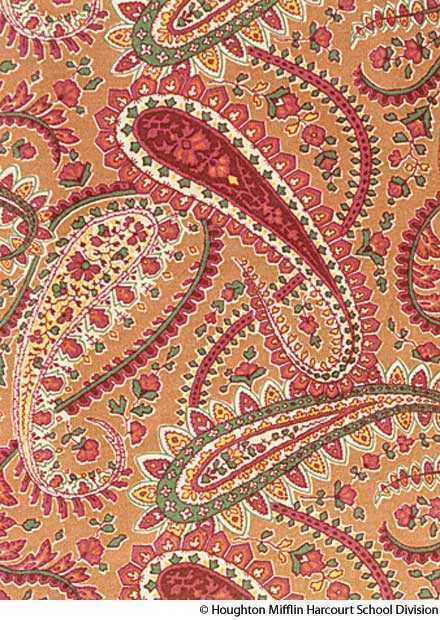 Fabric that has a colorful swirly pattern that is used to make curtains or a skirt is an example of paisley. "paisley." YourDictionary, n.d. Web. 20 April 2019. <https://www.yourdictionary.com/Paisley>. a paisley cloth, shawl, necktie, etc. Having a colorful swirled design featuring intricately patterned teardrop-shaped figures. Used especially of fabric. 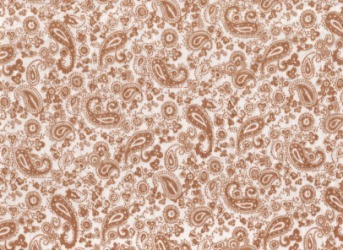 A paisley pattern or fabric. From Paisley in Scotland, where shawls of this kind were woven in the 1800s. In 1553 he received the lands of the abbey of Paisley, and in 1568 he aided Mary Queen of Scots to escape from Lochleven castle, afterwards fighting for her at the battle of Langside. The abbey was founded in 1163 as a Cluniac monastery by Walter Fitzalan, first High Steward of Scotland, the ancestor of the Scottish royal family of Stuart, and dedicated to the Virgin, St James, St Milburga of Much Wenlock in Shropshire (whence came the first monks) and St Mirinus (St Mirren), the patron-saint of Paisley, who is supposed to have been a contemporary of St Columba. The principal seats of the silk manufacture are Paisley and Glasgow. Macpherson, History of the Church in Scotland (Paisley, 1901); and J. Only Edinburgh, Glasgow, Dundee, Greenock, Aberdeen and Paisley have private and local acts, conferring powers exceeding the general law, to deal with, e.g.